Tracy-Ann Lavigne wasn’t sad after the Concordia Stingers women’s hockey team lost to the McGill Martlets in the Réseau du sport étudiant du Québec finals—not even a little bit. In fact, she probably wasn’t even thinking about the loss. Like a true athlete, her mind was already focused on the next challenge: the U Sports national championships in Napanee, Ontario. “To actually go to nationals for the first time and for my last year, it was just awesome,” she said. Concordia ranked seventh out of eight teams heading into the national tournament, but turned heads after upsetting the second-seeded Guelph Gryphons 4-3 in a shootout. They fell quickly from cloud nine after losing the next two games to the University of Alberta Pandas—who were crowned champions—and the University of British Columbia Thunderbirds in the bronze medal game. Despite the loss, Lavigne and the team relished in finishing fourth amongst 33 teams in the country and playing against teams they would normally never play against. “I’m happy that we finished fourth in the country because even though we didn’t win a medal, it’s been like  years that we didn’t go to nationals,” she said. Lavigne’s five years with the Concordia Stingers has been marked by ups and downs. Until this year, the team was underwhelming. 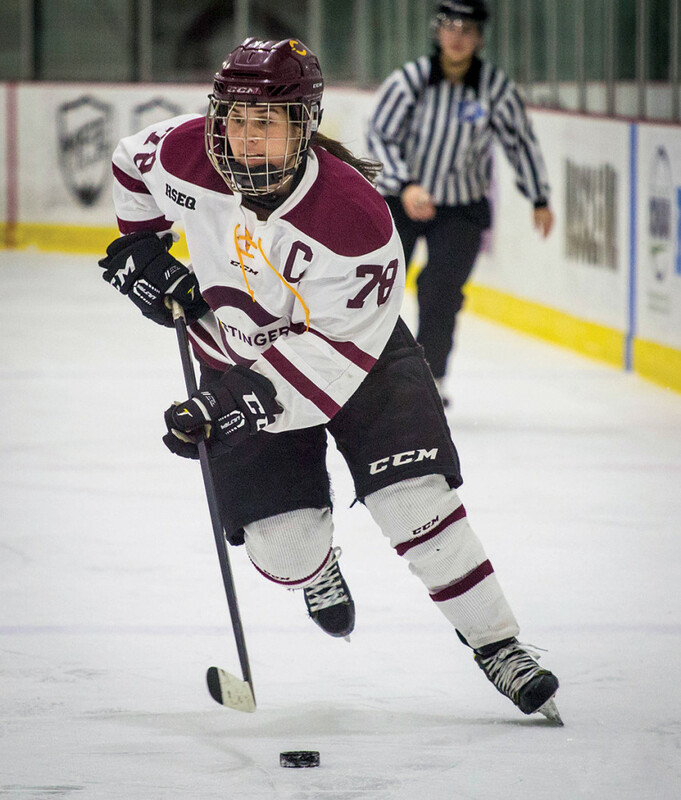 The captain recalled missing the RSEQ playoffs in her first season with the team in 2012-2013. Over the course of the four previous seasons, the team’s winning percentage was below .500. In total, they had 21 wins, 52 losses and seven overtime losses in 80 regular season games. The Stingers have turned heads this year. After getting off to a slow start with seven losses in their first 10 league games, they quickly turned things around in the second half of the season. With seven wins and three losses to finish third with 21 points in the RSEQ conference, Concordia managed a .500 win percentage. “We had such good recruits coming in this year that our whole attitude changed,” said second-year forward Claudia Dubois. Concordia then went on to defeat the defending U Sports champions Université de Montreal Carabins in a two-game sweep. That achievement itself was enough to standout as one of Lavigne’s most memorable moments as a Stinger. Another memorable moment was reaching the U Sports National Championships. By making it to the RSEQ finals, Concordia automatically qualified for the tournament for the first time since the 2004-2005 season under then-head coach Les Lawton. The former coach came to nationals to give advice to players and the coaching staff, who were only getting their first taste of national competition. Like the seven other teams, the Stingers played three games in three consecutive days—something they did during pre-season and the Theresa Humes Tournament in December. While the Stingers didn’t acquire any hardware, they welcomed the experience of playing against teams from different conferences. In the RSEQ, they only face four other teams. For players like Dubois, playing for veterans like Lavigne made the tournament even more special. The graduating veterans can scratch nationals off their bucket list. Lavigne’s personal bucket list, however, keeps growing as she has set her sights on trying out for Les Canadiennes of the Canadian Women’s Hockey League next year. The Stingers’ seemingly overnight success—compared to previous seasons—looked almost too good to be true. Concordia has been slowly cultivating a new team culture centred on accountability and having a “team first” mentality. As one of the oldest players on the team, Lavigne first witnessed this shift in mentality during her third year when Chu began taking a bigger role as an assistant coach. It took time for the Stingers to come around and truly buy into that mentality, as some players didn’t appreciate the new system. Lavigne said that over time, there were fewer and fewer players that felt alienated by it—and it showed this year. While the team got off to a rocky start, Chu mentioned in a mid-season interview that her team needed to focus on becoming mentally stronger and believing that they can beat McGill and UdeM. They gained momentum as the second-half of the season progressed, picking up big come-from-behind wins and defeating McGill on one occasion. Chu hopes to capitalize on the momentum of this season and bring it into the next. With many returning fourth and fifth year players, the head coach and recipient of the RSEQ Coach of the Year award will rely heavily on her veterans to set a strong example for everyone. The Stingers will only lose four players going into next season: back-up netminder Briar Bache, forwards Anne-Julie Deschenes, Valerie Wade and of course, Lavigne. The players will nominate a new captain next year prior to the beginning of the season. While Lavigne donned the “C” on her chest for only one season, she left her mark.